Matcha is packed with antioxidants, detoxifies and boosts metabolism – the perfect drink in the morning. Now, add this drink to your list of favorite cocktails by adding gin. 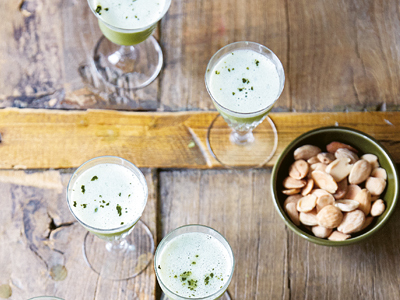 Lottie Muir, author of WILD MOCKTAILS AND HEALTHY COCKTAILS, shares her recipe for Matcha Sour, guaranteed to be your favorite post yoga class treat. Matcha green tea is all the rage and for very good reason. If it is prepared properly and if you use ceremonial-grade matcha, you will experience so many wonderful taste sensations, let alone health benefits. It is rare to be able to taste vegetal, grassy, bitter, sweet, and malty flavors with just one ingredient. The trick seems to be to use the most expensive grade of matcha tea you can afford—for both flavor and color—and to make sure you don’t burn it, as this creates an unpleasant bitterness and a duller green color. When mixed with a dry gin, the botanicals blend beautifully. Here, you could also try using bison grass vodka for a similar effect. The basil provides another level of herbal wonder. Use Thai basil for a bit of a kick, or any other herb that takes your fancy. This method could, I suppose, be called cold brew—in fact, it’s an instant cold brew… there’s no hanging around with this one! Carefully measure 1 level teaspoon of matcha tea into the bowl and pour over the gin. Using the egg whisk or bamboo chasen, whisk the matcha rapidly to blend it with the gin. You want the gin to practically foam, so will need to make some effort here. Fill your cocktail shaker two-thirds of the way up with ice and add the gin/matcha mix, together with the Honey Syrup, lemon/yuzu juice, egg white, and basil leaves—smack the leaves first to release their essential oils. Cover and shake vigorously for at least 20 seconds to ensure the egg emulsifies. Use a hawthorne strainer and tea strainer to double- strain the mix (see page 25) into the glasses. Garnish with a few tiny dots of matcha powder or a basil leaf, and serve immediately. Pair your Matcha Sour with a yummy dessert! Create delicious mocktails and low-sugar cocktails, using home-grown and foraged ingredients. 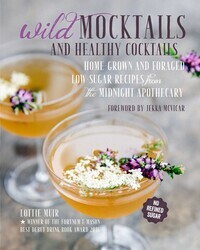 Award-winning cocktail-maker and gardener Lottie Muir brings you another selection of wonderfully wild and flavorful concoctions from her pop-up bar, The Midnight Apothecary. For this new repertoire of drinks, Lottie set herself a threefold challenge: to achieve the same amount of pleasure and balance that refined sugar provides in the taste and mouth-feel of a cocktail, to create new aromatic and bitter-forward drinks, and to make delicious new mocktails for those who want to consume no, or less, alcohol. Lottie has created delicious infusions, cordials, sodas, shrubs, bitters, teas, and tonics that can be mixed alcohol free as mocktails—try out the Cherry Blossom and Flowering Currant Cordial, the Thyme and Licorice Syrup, or the Iced Spring Tonic Tea—or added to your favorite spirits to create a magical take on old-time classics, such as the Wild Negroni or the Windfall Punch. There is the perfect drink for any time of the year and whatever your mood, so whether it is Dry January mocktails that you need, no-added-sugar fun, or the restorative powers of an indulgent cocktail, Lottie’s plant-powered potions hit the right spot.